Are you planning a corporate golfing day, a charity event, a school golf competition or are just looking for a fabulous golf related promotional item. This is the perfect choice. It is cute and trendy, well made and brandable. Golfers love collecting golf-related gimmicks and this will be on the top of their list. Hand them out as freebies at your event and watch the reaction you get. Our little golf bag is also a stress toy, making it even more functional and fun. Stress is a huge problem in the workplace, leading to many hours of lost productivity. Do your bit to help relieve stress by giving your clients a fun toy to bash and smash when they feel the need. 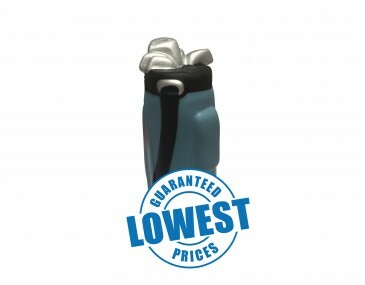 This adorable little golf bag comes is a light corporate colour. It features a dark shoulder strap down the side, a dark lid on top and a number of golf club heads peeking out from the lid. Everything a golder needs to hit those holes in one. Brand your company logo and graphics onto the bag for a great advertising campaign. Our listed price includes branding of your logo or graphic in a single colour print using pad printing. Please note that our prices exclude GST and a print set up of $75 applies. We only supply stress balls in bulk orders. The minimum order volumes is 100 pieces. We offer a product turnaround time of two weeks, but we can offer even faster turnaround times for urgent requests.